Wikipedia on the Spanish Language: a Goldmine of Resources! A quick Google search for "Spanish language" this morning led me to the Spanish Language page of Wikipedia. Hours later, I am still blissfully browsing and following links. The page is a goldmine of information and links for everything from a list of all the countries in which Spanish is the official language, to handy phrases you can listen to, a detailed pronunciation guide, comparisons with related languages, history and a look at regional versions of Spanish - how you might alter your Spanish-learned Castilian to carry on a conversation in Argentina or Peru. 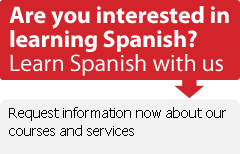 There's a handy list of Spanish words taken into the English language, if you'd like to get a glimpse of how Spanish has affected other widely spoken languages. Best of all, the page links you to Wikipedia's impressive list of Spanish language rock groups, sorted by country and conveniently linked to the groups' websites, in case you'd like to sing your way to learning Spanish.